This astonishing picture shows the entire sky from horizon to horizon with the help of a wide angle lens (to help orient you, south is to the left, north to the right, west at the bottom, and east is at the top). It was taken on a volcano called Chimborazo, which is in Ecuador. The volcano has a latitude of 1.5° south, so it sits almost exactly on the Equator [Update: Stéphane sent me a note that he has been to this volcano before, and has an amazing Milky Way picture taken from it.] Guisard started the exposure about an hour after sunset, once the sky got dark, and ended 10 hours later, about an hour before sunrise. Because of this, it shows roughly 90% of the entire visible sky! If you’ve ever been to this blog before, you know I’ll be happy to explain. But it takes a minute, so I’ve split the rest of this post up into two sections: you can read about the guts of how this picture works just below, or you can skip to the part where I describe what’s in it (stars and so on). Enjoy. OK, we need a a little geometry lesson. Imagine you are standing on the north pole. 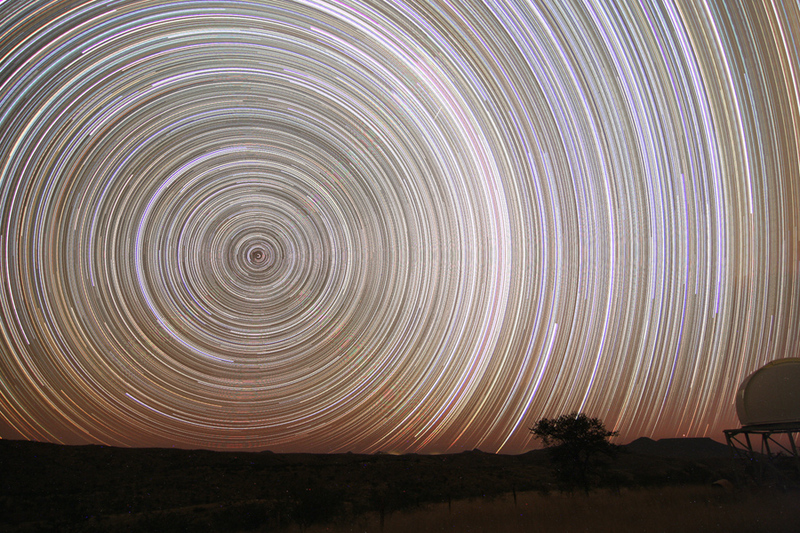 As the Earth spins under you, the stars appear to make circles centered directly over your head. Polaris would make a tiny little circle in 24 hours (it’s not exactly on the north celestial pole, the point in the sky directly over the Earth’s north pole, but it’s close), and stars farther from the pole would make bigger circles. At the horizon, the circles would be biggest. But that’s all you could see. The Earth itself blocks your view of the southern sky, so you can only see half the entire sky. The stars all make circles that are parallel with the horizon, so they never rise nor set. It doesn’t matter what time of night you go out; you see the same stars, just in different positions in the sky. You’ll never see Alpha Centauri or the Southern Cross. The same is true if you were to stand on the south pole, except this time you can only see the southern sky. The Earth would forever block your view of the Big Dipper, Polaris, and other exclusively northern sights. Things change if you’re on the Equator. Facing north, you would just see Polaris on the horizon — and actually it would be a bit above the horizon, due to, of all things, our atmosphere. The air of the Earth acts like a lens, bending the path of the light from stars near the horizon. Because of this, Polaris would actually be about two degrees (about 4 times the size of the full Moon) above the horizon. If the Earth had no atmosphere, Polaris would be exactly on the horizon as seen from the Equator. Turning round and facing south, you’d see the south pole of the sky (marked by the much fainter star Sigma Octans), which would likewise be on the horizon. Facing east, you’d see stars just now rising, and facing west those that are just now setting. If we had no Sun, over the course of 12 hours you’d see every single star in the sky as the Earth rotates beneath you. That’s because any star just setting in the west as you start your observation will be just rising in the east 12 hours later. However, we do have the Sun (yay!) and so you can’t observe for 12 straight hours, only realistically about 10. So you don’t see the whole sky over the course of the night, you can only see about 10/12 = 5/6 = 80%. If you can push the observing for another half hour you can get up to about 87% of the sky. [Update: Stéphane corrected my math here, and he’s right. My apologies for any confusion!] Astronomers divide the sky up into 24 hours — in this case, each "hour" is the distance a star on the Equator of the sky will travel in that time. It’s equivalent to 15 degrees (360 degrees / 24 hours = 15 degrees per hour). The part of the sky not seen in a picture like the one above is shaped like a watermelon slice, with the narrow points at each pole and the widest part at the Equator, near the Sun’s position. It’s one hour wide on each side of the Sun, so altogether that slice is two hours wide. That means the picture has the entire sky (24 hours) minus those two hours, for a total of 22 hours. The amount of sky seen is therefore 22/24 = 11/12 = 92%. Plus, the Earth’s air give you a bonus: because it bends the light of stars low to the horizon, you can actually see stars that are below your physical horizon! In a sense, the air is acting like a periscope, allowing you see around a corner. So all this together means that Guisard’s remarkable all-night photo from the Earth’s Equator shows over 90% of the entire sky that is possible to see from the ground. 2) So what’s the deal with this picture, anyway? He used a fish-eye, a wide angle lens, to capture the entire 360° view of the sky. That’s why star trails near the poles are distorted. The bright trails near the southern pole are from Crux, the Southern Cross. You can also see a bright meteor that blazed its way near the pole, too. The reddish-orange streak to the right of center and extending almost the whole picture vertically is from Arcturus. I suspect the red streak just to its left that only extends a third of the way up from the photo’s bottom is Mars. I think the whitish streak to the upper right is Capella, and the bright blue one just to the right of that is Vega. Interestingly, Orion straddles the Equator, so the three stars marking the belt would all blur together in a picture like this. Plus, this picture was taken when Orion was near the Sun, so it’s only seen briefly in this picture, making a short trail: orange-hued Betelgeuse is the very short streak at the bottom of the image, just to the right of center. I suspect the bright streak at the very top is Sirius, the brightest star in the night sky, and the bright streak near the bottom just to the left of center is Fomalhaut. The famous star Alpha Centauri is the long yellow streak to the left of center starting at the top of the image. Where that streak ends, at about the center of the picture, you can see an orange streak continuing just to its left; that’s Beta Centauri. I’ll leave the rest to you to discover. And I’ll note that I spent some time a couple of years ago in the Galapagos, at pretty much the exact same latitude this picture was taken. The southern skies are breathtaking, and seeing Alpha Centauri for the first time was incredible. I hope sometime to repeat the experience. And if I do, I may just try to get some star trail pictures for myself. Picture courtesy Stéphane Guisard, who actually alerted me to it. P.S. The title of this post is a pun on the title of a classic science fiction story by one of my favorite authors of all time. And that’s all I’ll say about that.